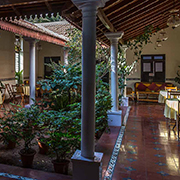 The Chittaranjan Palace, built for Mysore's princesses, has been lovingly restored as a charming hotel. In extensive gardens, with formal lawns and shaded pergolas, and fringed by majestic trees, the hotel is an oasis of calm. 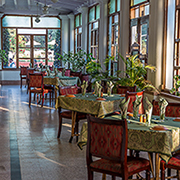 Renovated and furnished using traditional Indian crafts, the hotel offers comfortable surroundings, friendly staff, and a restful, creative atmosphere. Guests have come for a night and stayed for a month! The Green Hotel has been set up as a model of sustainable tourism, by the Charities Advisory Trust, a UK charity. All profits are distributed to charitable and environmental projects in India. The hotel incorporates energy saving initiatives: solar energy; recycled water for the garden. Where possible we have used Indian crafts, providing employment for traditional craftsmen, many of them National Award winners. By finding an economic use for the palace and its historic garden we have saved it from demolition and re-development of the site. Mysore, the charming town and immortalised by RK Narayan in his Malgudi novels, provides an excellent base from which to tour South India. The Western Ghats, the coffee plantations of Coorg, the game reserves of the Nilgris and the Ooty hill station are all within a few hours drive. Mysore is 140km from the bustle of Bangalore. The hotel restaurant is open to non-residents. It offers a comprehensive range of vegetarian and non-vegetarian food. Special diets can be catered for. Breakfast is included in the room rate and lunch or dinner can be purchased from our restaurant. The Malgudi is a departure from your run of the mill Coffee Shop. The Malgudi is completely run by women-perhaps the first of its kind in the country. Trained by French bakers, these young women have set new standards for Mysore, bringing you the best bakery in town. © 2019 The Green Hotel. All Rights Reserved. An initiative of The Charities Advisory Trust. UK Registered Charity 1040487.